NTLite is a commercial tool (with a free-for-personal-use version) which allows you to build a customised Windows 7-10 installation disc from your existing Windows disc, or an image (ISO, ESD or WIM, including the WIM file on your current installation). You can slim down Windows by leaving out components you don't need. The free NTLite can remove items like Active Directory's Directory Services, the BranchCache Client, HomeGroups, Remote Desktop Client/ Server, BitLocker, Hyper-V, MobilePC and Parental Controls. Upgrade to a paid version and you can also drop most of the accessories, unwanted drivers, language packs, Windows Firewall, Windows Defender, even low-level components like SuperFetch or Windows Search. You're also able to add items to your installation, including Windows updates, service packs, language packs and drivers. There are options to tweak various Windows settings, for example customising the startup state of various Windows services. You're able to define the answers for every step of the installation process, ensuring it runs unattended, with no prompts. 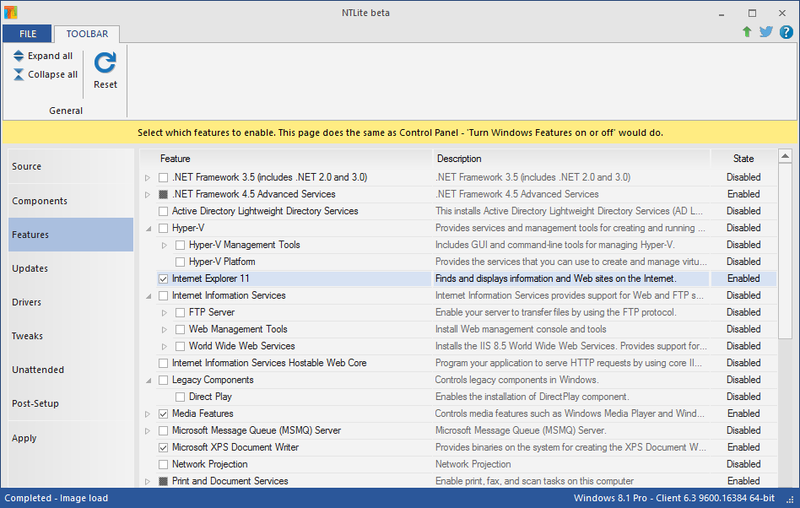 And there's an option to run defined programs, scripts or .REG files post-installation to apply any remaining tweaks. Upgrading to NTLite Home ($45) gets you the ability to remove many more Windows components, has better hardware and device driver support, can clean up the WinSxS cache for you, and is able to apply all its tweaks to the live installation. Once you've finished, all the editions will create a bootable ISO file from them, as long as the normal image folders (\Boot, \Sources etc) are present. This isn't for novices - leaving out core Windows components can have serious effects - but if you know what you're doing, NTLite is a great tool which can save you a vast amount of time and help you build a faster, more secure and lightweight version of Windows.